We can be contacted by email at shop@one.world (retail) or sales@one.world (trade) or through Live Chat on our website. You can place an order on the website 24 hours a day – but our office hours are 9-5 Monday to Friday, which is when we are available on Live Chat. We will reply to all emails within 24 hours (business days). How do I get more information about a One World product? 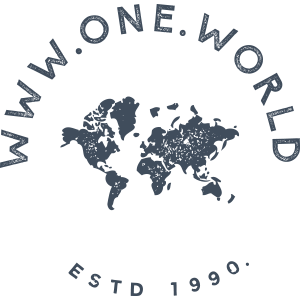 Just email us at shop@one.world with which item you are interested in and what additional info you require – and we will get back to you ASAP. I am interested in ordering a large piece of furniture, how will it be delivered? All products that are labelled as a “Large Item” will be delivered using our dedicated 2 MAN delivery team within 7-10 working days. It’s worth pointing out that the delivery charge is the same if you order one item or if you have multiple large items on your order. Once your order has been placed, our 2 MAN team will then contact you directly (usually within 3-5 working days) to book in your delivery. Our 2 MAN team are extremely helpful and will deliver the item into a room of your choice. They will also unwrap the item and remove the packaging should you require. They can also help assemble the item for you – but we will need to know in advance of the order being delivered. There is a £25 charge per item for assembly. Once the delivery has been made please check the item thoroughly before signing for it. Any damage must be noted on the delivery sheet before signing. I still haven’t received my order even though I have been notified of its dispatch? Your dispatch email will include a tracking link which will direct you to your tracking information. You will then have the option to visit the courier’s tracking site, where you will be able to access the most up-to-date tracking information for your parcel. If this doesn’t help, then please email us at shop@one.world stating your name and order number and we will look into it immediately. Yes, but please let us know as quickly as possible. If the order hasn’t left us yet then we can certainly make this change. Please email us at Shop@one.world or jump on the Live Chat. Sadly we can’t add an extra item to an existing order – but our website is easy and quick to use, so jump on there and place a new order. If you’re quick then we can deliver all the items together. I can’t complete the payment transaction in the checkout on the website? If you are still having problem then please email us at Shop@one.world or jump on the Live Chat. Your promotional code must be entered on the website in the relevant box which will appear in your Delivery Van/Shopping Basket or in the Checkout. It’s nice and easy. Please check the terms and conditions of your promotional code for further details. I forgot to enter my Coupon Code, can this be refunded? We are happy to refund the coupon code if you have forgotten to apply it, providing it was live and valid at the point of purchase. We cannot refund any promo code on orders placed outside of an offer’s validity period. The price of an item has changed since I purchased the product. Will you refund me the difference? One World reserves the right to change prices at any time without prior notice. During a sale period, prices can change without prior notice. Can I order an item that is not yet in stock? If the item you want is out of stock but we have a delivery date set, then you will be able to Pre Order the item. These items are often popular and can quickly go out of stock, so we recommend ordering as soon as possible to avoid disappointment. Once your order has been despatched, you will receive an email from us confirming shipment. Your email will include a tracking link which will direct you to your tracking information. You will then have the option to visit the courier’s tracking site, where you will be able to access the most up-to-date tracking information for your parcel. For larger items, our delivery partner will get in touch to book in the delivery with you. What happens if I receive a damaged or faulty item? Please ensure that you check all items on receipt and ensure you report a faulty or damaged item as soon as possible (or at least within our returns period). In the unlikely event that your item has arrived faulty or damaged, then please email us Returns@one.world, so that we can arrange a replacement or collection for you. The product that I received doesn’t look exactly the same as the picture on your website. What’s the reason for this? Many of the products in our range are; handmade, made with natural imperfections, made with a unique finish, come in a unique shape. Consequently, they may vary from the picture you see on our website. The dimensions can also vary slightly. It’s often worth closely looking at the Product Name or description to get a better understanding of these types of items. They are often described as; “Vintage”, “Antique”, “Rusty”, “Washed”, “Brushed”, “Rustic”, “Distressed”, “Weathered”, “Aged”, “Handmade”, “Hand-Finish”, “Natural”, “Traditional”. Please visit our Returns page, which will tell you everything you need to know. Is it possible to loan an item for a magazine photoshoot, blog or influencer channel such as Instagram, Facebook, Pinterest, Houzz etc? Yes, we’d be happy to help. Please drop us an email at shop@one.world with the details of the item that you like and we’ll do our best to help. We do indeed. All details of our programme with Rakuten Linkshare available here.